The University Hospitals Leuven are a network of hospitals on campuses at Gasthuisberg, Lubbeek, Pellenberg, Sint-Pieter and Sint-Rafaël. The 1,995 beds at the University Hospitals Leuven make it the largest hospital in the country. The forward-looking infrastructure at the Gasthuisberg campus provides a fitting environment for high-tech medicine. The centre was designed along the lines of a revolutionary new concept: the complex itself was built around the various functions it was to perform, rather than vice versa and as such integrates all manner of medical and paramedical disciplines seamlessly. In this way, the building complex seamlessly integrates all medical and paramedical disciplines. University Hospitals Leuven care for patients, conducting research and providing academic training. So many diseases are identified, studied and treated that it has built up a genuine wealth of expertise and knowledge. The reason for its success is its continual flow of ideas, innovation and scientific research at the highest level. University Hospitals Leuven provide treatment in all fields of medicine. Comprehensive care is available at all times in the fields of prevention, diagnosis, treatment and rehabilitation and both outpatients and inpatients receive a high level of medical and paramedical care thanks to our caring staff and innovative research and equipment. Top-quality care also entails ongoing critical analysis and testing. Doctors take refresher courses throughout their careers, their training never ends. Leuven University Hospitals is the first Belgian hospital with a Joint Commission International Quality Approval (July 2010). Leuven University Hospitals constantly strives to be a leading international centre in terms both of structure and provision of care. Its focus on Europe helps it to expand and broaden its expertise and thereby offer the highest-quality treatment to all patients. 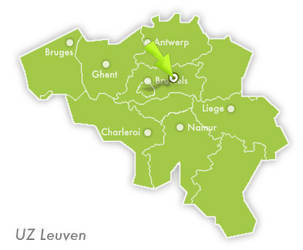 UZ Leuven is located approximately 23 km from Brussels National Airport. There is a direct train connection from Brussels National Airport to Leuven. Several buses leave Leuven station for the various campuses of UZ Leuven.